Hirtshals is the perfect place to explore by bicycle. Over the summer months you should definitely take the trail between the two beaches of Kjul and Tornby. Here you’ll find miles and miles of sand dunes, rolling waves and a real holiday atmosphere. Hirtshals town itself consists of a charming little centre of bars and eateries in an idyllic seaside setting. Naturally, Hirtshals also offers a vast array of fresh fish and seafood, so the local restaurants are certainly worth a visit. Why not try your own luck at fishing from the pier? 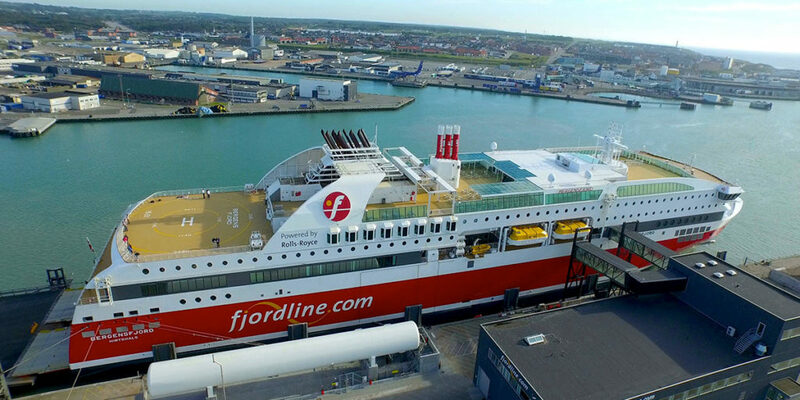 Fjord Line’s cruise ferry MS Bergensfjord docks at Hirtshals. Parking spaces are limited in the terminal vicinity. We suggest you look for parking spaces in the area and in the town. It’s also possible to park at Hotel Skagas’s car park – ask at reception. Prices are NOK 50 per day and NOK 250 per week. It is not possible to book parking in advance. The terminal is located at the Port of Hirtshals, appx. 35-40 minutes walk from the town centre. Spend some time getting to know Hirtshals! Here are our six top tips for what to see and experience in the Danish port town. This is an absolute must when the whole family is visiting Hirtshals. The Oceanarium holds 4.5 million litres of water and is the largest aquarium of its kind in Northern Europe! The aquarium is especially aimed at young children, but it’s also hugely enjoyable for those of us who are a little older. All visitors can look forward to learning lots, having a terrific experience and who knows, maybe even come into close contact with a fish! At Nordsøen Oceanarium, visitors are actually allowed to stroke some of the 3,000 fish living here. During World War II, German soldiers dug a large number of bunker compounds along the Danish coast, including at Hirtshals. The Hirtshals compound is the only one that is still intact. The museum has been meticulously excavated and you can now wander around and discover what it really looked like during the war. A must for all history enthusiasts! Hirtshals museum tells the story of the town’s biggest industry – fishing. Appropriately enough, the museum is located in an authentic fisherman’s dwelling dating back to the 1880s. The house has been reconstructed with period furniture, presenting an authentic impression of how the local fishermen lived at that time. Boat enthusiasts will also enjoy seeing the two types of boat that were commonly used, which are also on display: The Hirtshals rowboat, which was the preferred boat in the 1850s and the motor boat which took over in the following century. Every Wednesday you can also make your own “bjesk”, a local herbal spirit that was very popular among the Hirtshals fishermen. Sometimes what you really need is just a little peace and quiet, which is something you’re guaranteed to find in a lush, green park. The extensive Folkeparken in Hirtshals is where the locals go for a relaxing break. This peaceful park is at the south-eastern end of Hirtshals and offers a good mix of conservation areas, parkland and playground. People of all ages come here to unwind in summer. Just a short drive outside Hirtshals, Farm Fun – as the name suggests – offers its visitors a range of animals and plenty of entertainment. The park contains no less than 500 animals, large and small, of both local and international origin. Here you’ll find horses, geese, llamas, pigs, deer, goats, sheep and a variety of birds. The farm is also filled with other fun activities such as climbing frames, swings and a bouncy castle. Maybe you’ll even be tempted to visit the barn to try jumping into the haystack? Farm Fun is open throughout the summer holidays with variable opening times – please check the website for more information. Follow the E39 toward Hirtshals. When you arrive in Hirtshals, follow the signs to Fjord Line. Buses from Hirtshals station to the ferry terminal leave at 07:30 and 18:30. Bus from the ferry terminal to Hirtshals station leave at 08:15. Payable in cash or by credit card on the bus. If you’re travelling on a cruise from Bergen or Stavanger, you can take the bus from the centre of Hirtshals to the centre of Aalborg or Aalborg Storcenter (Bilka). Read more about our bus service here. There are good train and bus connections to and from Hirtshals. See the timetables at www.rejseplanen.dk and www.dsb.dk. The closest station to the ferry terminal is Lilleheden. For the Lilleheden-Hjørring stretch, you can only buy tickets in Danish kroner. Credit cards cannot be used. You can pay in DKK, NOK and EUR at the ticket office. Payment with coins is only possible in DKK. No. You may withdraw cash on board. Coffee and soda vending machines are located on the ground floor of the departure hall and in the waiting room by the car spaces. Arrive at least 60 minutes before departure.